Eerdmans has printed the third edition of this scholarly work by Estep, professor Emeritus of Church History at Southwestern Baptist Seminary in Ft. Worth. 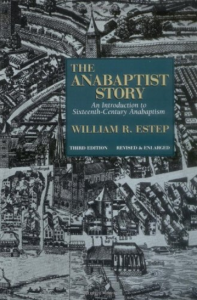 It is a fascinating account of Anabaptism from Zurich to England in the fourteenth and fifteenth centuries. It is always amazing to read about (and see good documentation for) the great price paid by this “third player” of the Reformation. These were people who, mostly, were born Catholic, converted by the Reformers, but became independent thinkers by reading their New Testament (in Greek) and committing themselves to believer’s baptism and the purity of the local church. It is also refreshing to see the ordinances practiced in simple New Testament faith without the encumbrances placed upon them by later Baptist groups.